I’ve been eyeing this trip now for while. 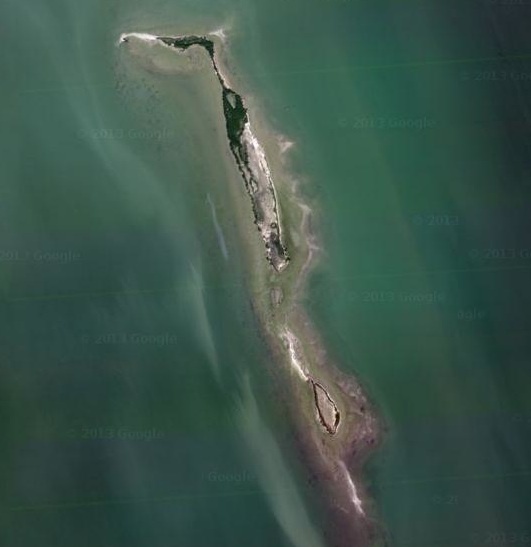 There is a spoil island on the ICW (Intra Coastal Waterway) in the Laguna Madre (bay) here near South Padre Island, Texas. I’ve been past it several times and always thought it would be a neat trip to do. 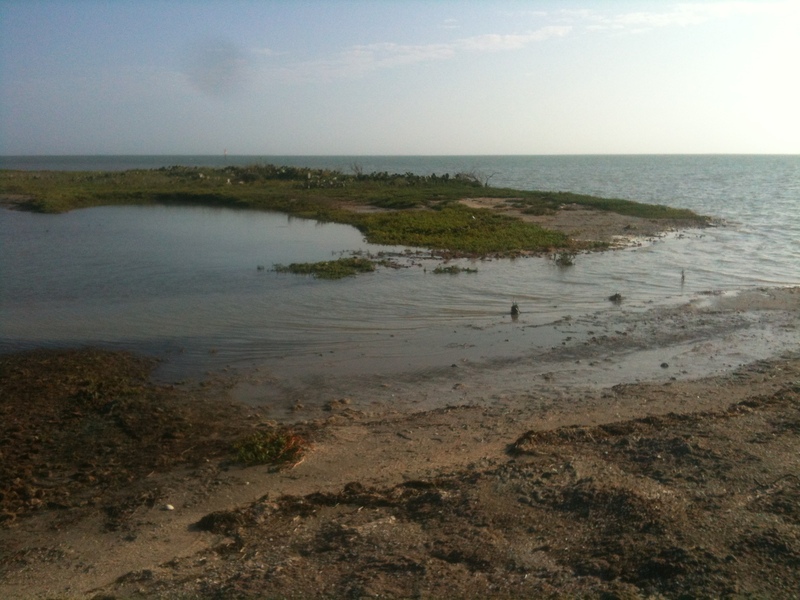 Having done most of the waters in the lower part of the bay I was wanting venture out. It would also be a scouting mission for other trips I have in mind and as this would be the last possible place to camp before the last stretch for home. I also want to know how long it would take from here to make it back to my take out point and home. Having my kayak already packed and mostly ready to go I just need a good time to go, and I was certainly itching to take off as I’ve been cooped up for awhile, ok, way too long! I was waiting for some glueing projects to dry before I sanded them and there was a good north front about to hit this weekend , ok time to shove off! 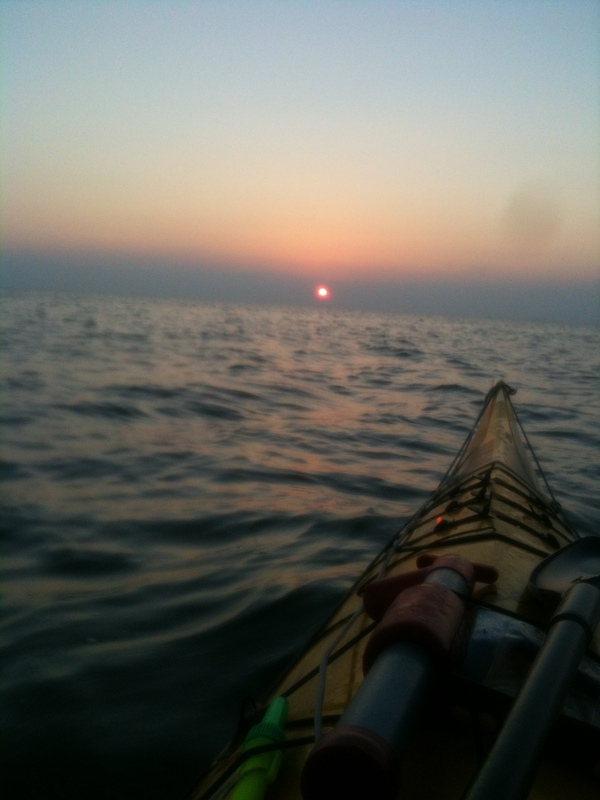 I started paddling at 3:30 in the afternoon (20nov13) and knew it was a bit of a late start which would mean I’d get there after dark I figured. My route took me up past the convention center and up towards the end of hwy 100 where the Adventure Park is and the spi kite ranch. Along the way I noticed the extremely high tide and the windsurfing flats were underwater, ok, it’s mostly kiteboarding now a days but, so I’m thinking, if it’s this flooded here what about where I’m going? These spoil island don’t have much elevation! If worst came to worst, I’d fuel up and head back, it’s not that far, not for someone like me anyway. It was 2 hours to the kite ranch about 7.5 miles away going with the wind and waves with the loaded boat, I wasn’t going all that fast, it wasn’t a race but was glad for the help. I knew that on the way back things would be different, much different! At the kite ranch I’d head west, I checked the gps and my heading and lined up with the beautiful setting sun but it didn’t last long and set behind the clouds and haze on the mainland. I followed the route by keeping my boat to the same angle of the waves and not looking at my gps or compass. The further into the bay I got the darker it got and I was out of sight of land. I kept the same heading as it got darker but then some lights appeared on the far shore and it was right inline with my route, cool. Then a few more lights next to it came into view and as I approached the ICW I could see flashing green channel markers plus some other lights that I couldn’t ID so it was time to turn on my white nav light just in case. 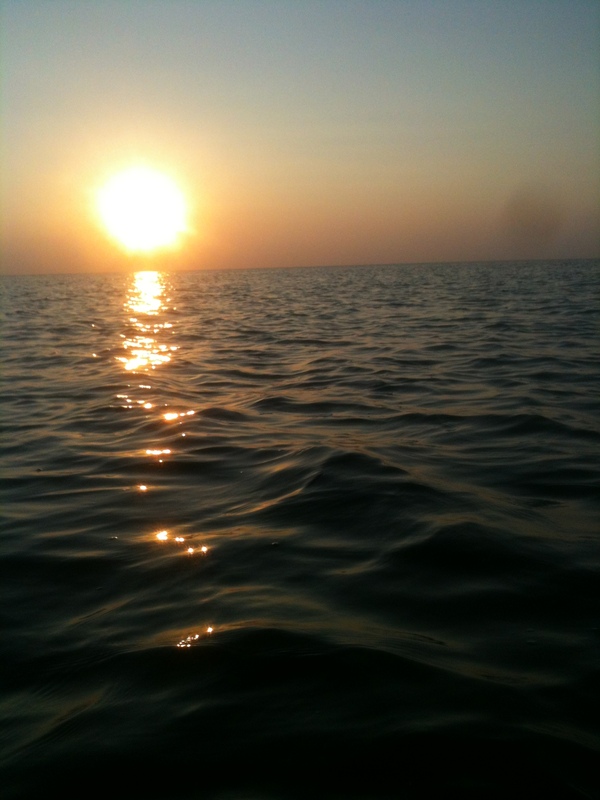 Now it was very dark and I was in deeper water so the waves were building and I was being quartered by them. I wanted more than just a typical training session, I needed a challenge and adventure and I was getting it, finally. 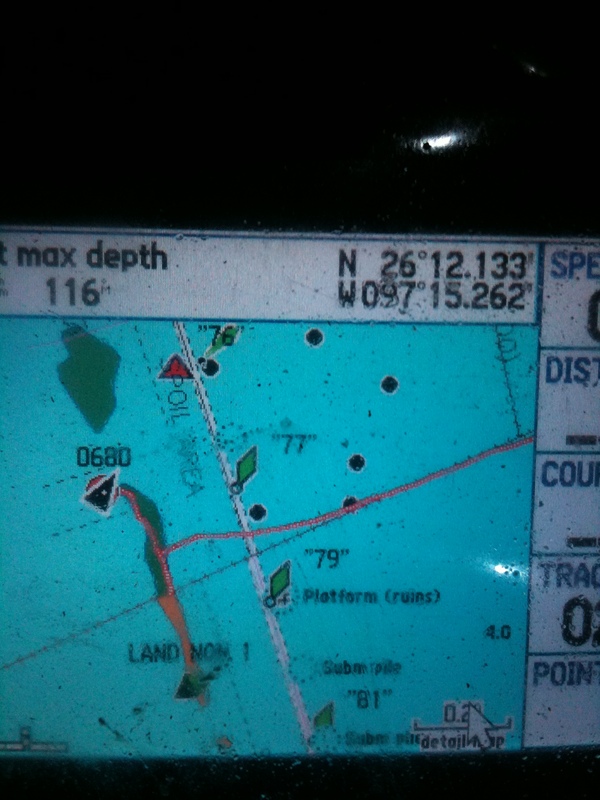 I make it across the ICW and spot the spoil islands and see it on the gps and I’m exactly on target. At first glance it looked like a big wall of white crushed shells that I could camp on but quickly noticed oops, that is just a reflection of the water in the flooded flats behind the wall of seaweed. Time to head up and down the island to see how it looks. I headed south and it was the windward side and was getting beaten and everything was flooded, things weren’t looking too good, lets try going the other way to the lee side. 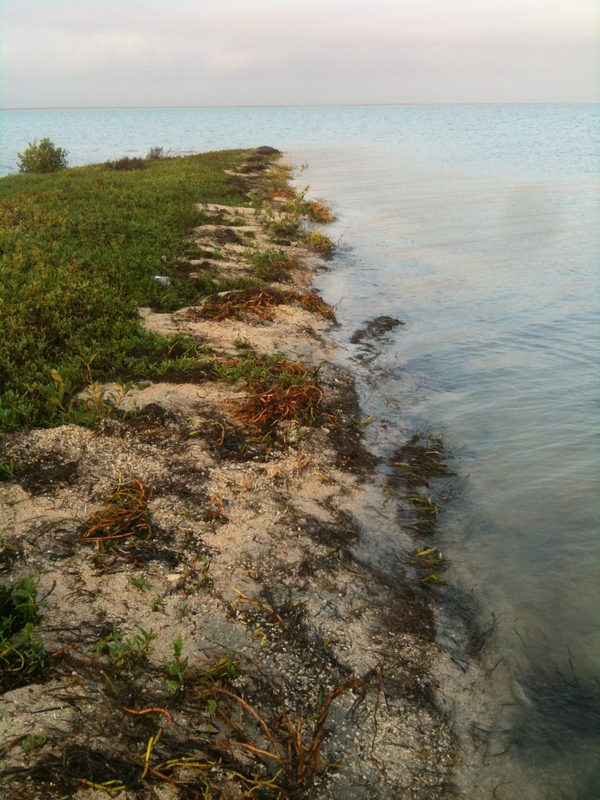 Mangrove were everywhere and no dry ground , I kept going. If I don’t find anything then what? Move to the next island? Sure, but as I rounded the north end and I got into the calmer waters of the lee side I saw what could, what might just possibly be some hard ground? I beached and took a look see. Ok, I’ve seen better and much worse, but there was just enough between the bay on one side and the march on the back side to fit my two person tent, barely. Ok, good enough! The “dry” ground was a mixture of crushed shells, course sand and seaweed but everything was damp, no prob, I have an attached plastic sheet under my tent to keep things dry. 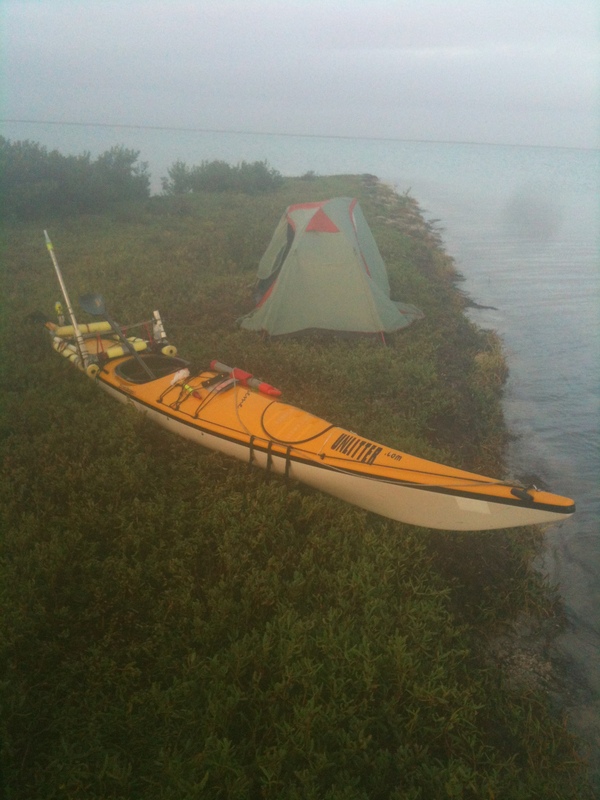 With the tent setup and the kayak stowed I wasn’t much hungry so I checked the cell phone and had a signal so I made a call and sent a text, yeah, that always feels weird when doing these kinds of things! I didn’t have my spot tracker activated where all I’d have to do is hit the ok button and those that were watching and concerned would know everything was alright. I’ll have to work on getting that $150 activation fee back into the budget somehow. When it’s dark and not much to do I can drift off to sleep pretty easily but it was much much too early yet! I get a text, thanks T! Moon! The sucky part about a tent is when it’s all zipped up there’s nothing to see, much unlike my hammock camping. With the flashlight on hanging from the roof I couldn’t see the glow of the moon thru the tent. When I opened up the rainfly it was like WOW! I’m right on the edge of the water and the moon’s refection comes almost into my tent. Spectactular! With no mosquitoes I’m able to gaze at it for awhile and take a few worthless photos of it with my iPhone. While I’m prepared to cook, or boil water really, I’m not up for it and instead pull out some chocolate chip cookies and an apple. I know I’ll have to do better in the morning in order to fuel up for the trip back, what ever direction I end up choosing cause at this point all options are open. 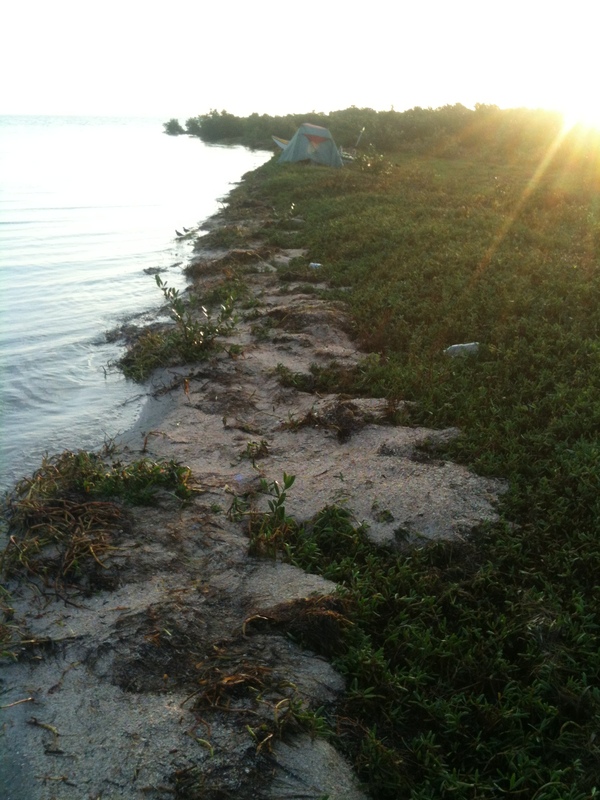 As the night went on the tide kept coming in, one corner of my tent was getting a bit soggy from the marsh to that side. The water table was rising! I knew at day break the tide would be back out again so all I had to do is wait it out, even if I was asleep! Was it ever noisy in the water, fish were going absolutely nuts everywhere! I was thinking that this would be a great place to fish! Setting up in the dark is nothing new to me and I seem to do that more times than not but I’d rather not, it doesn’t seem to stop me though. One wonderful thing about it though is waking up in the morning and taking your first views of where you are at. It really is a thrill to see where you ended up and the beauty of what is around you and especially in this case being oh sooooo close to the water on all sides! Since I’m not on a paddle odyssey of distance I got time to get out and explore and not strike camp before there’s better light to take photos of the camp. I tend to miss these photos by getting an early start in many cases. This time though camp and sit and I can explore, but there’s not much to explore, it’s all underwater! It could, it would, it should be a fun place to come back to later on but in looking at the next island to the north I see a bit higher ground so it draws me that direction. I strike camp taking photos along the way and think about my route home. There’s options but I’d really like to know the direct route home so I can use this info for later and longer trips. Scanning the bay I can see the tallest of the building on spi and it’s directly into the wind and waves so I know it’s gonna be a tough paddle back. I decide on breakfast, Spiz, my protein drink, quick simple and time tested, this would do just fine. I launch for the next island to take a look see before heading back. This island has promise, it has much higher ground as I look across the short pass but at night time it wasn’t to be seen. On landing I want to explore but there’s cactus everywhere and I name it cactus island, and the other island I’ll call mangrove island. At more normal tide levels this could be fun to camp on but even now it would be better than where I stayed on the other island. It was much more in the breeze though so the tent would have to tied down better. I saw some mammal tracks and noticed not a lot of bird activity or history of it. I did find a cool piece of drift wood and decided to bring it back with me somehow and found it fit into the front hatch, cool. The way back, 8 miles, straight into the waves, current and wind. I guessed 3 hours and nailed it. It was a pretty good section of open bay crossing that I hadn’t done in awhile but being directly into the waves made it easier than being quartered. 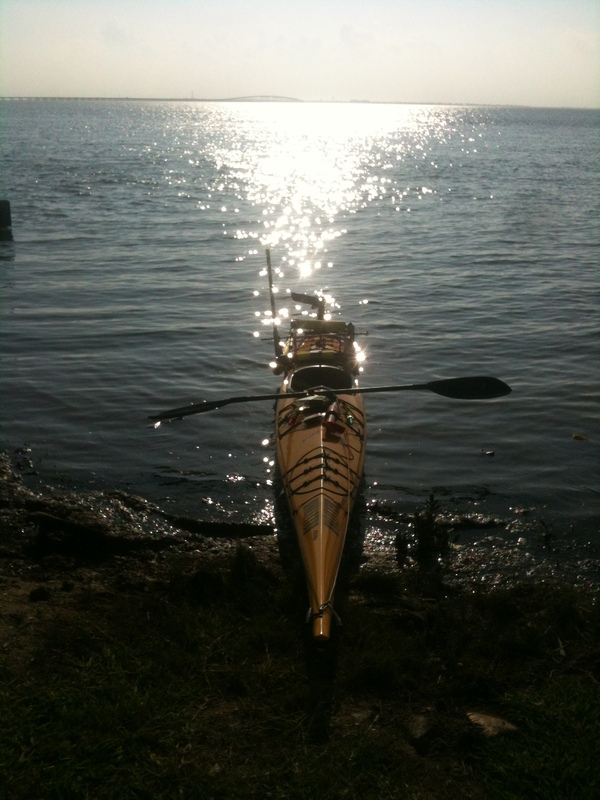 On on land, in my driveway, one could look at the bow of my kayak and wonder if such a slender cutting edge is really necessary but in the water it’s a thing of beauty to see how it parts the on coming waves, especially the steep short chop of the bay. With the deeper water and longer fetch some of the waves would merge, combine and multiply in amplitude, a rouge wave, and the bow would cut thru as it would break having the wash come all the way to the cockpit and into my mid section and soaking me pretty good. I’m looking for the water tower but can’t see it, not the one near my house, it’s blocked by other buildings so I just guessimate which is directly into the the waves anyway. When I started I couldn’t even see the causeway 8 miles back which gives you the feeling just how far away I was. It’s really not a good thing to paddle for visually because it just kinda looms in the distance for so long with out giving you a sense of any distance being made, better to think about something else to take your mind off from it so I do. What can I do to enhance the boat and the gear. What am I missing, what do I need. What’s on the wish list? I didn’t have the gps to where I can watch it and notice just how much slower I was going but it could have helped in when I’m searching for better form and efficiency in my stroke but I just paddle on the best I can without over doing it. Yeah, that’s something I should set up better later on, especially for when I do shorter 2-3 hour round trip training sessions. A better camera is on the list, waterproof and using AA batteries, if such a creature exists. My goal is to have as much as possible AA or AAA as there’s not much of a chance in charging batteries in my remote adventures. Winter is coming on, a drysuit would be nice as I’d need it for two big trips being planned. I left without a spare paddle, NOT GOOD! Though I plan to use my current paddle as my spare when I get an Epic mid/small wing paddle. I tried one in my hands it just felt sooooo good! Still much to get so it’s time to get back to the shop and get back to work. I pull into shore happy about how things went, I got my adventure and my challenge aspects accomplished which will hold me over for a bit and until the next trip I can just train because things can happen and I’d have to be ready if they did. No amount of money and gear will get you into shape except TRAINING! So I’ve had about a half a dozen people express interest in doing this trip and I think it’s just a bit beyond for most. Short fat kayaks should stay close to the dock where they belong. So what else can do this trip? 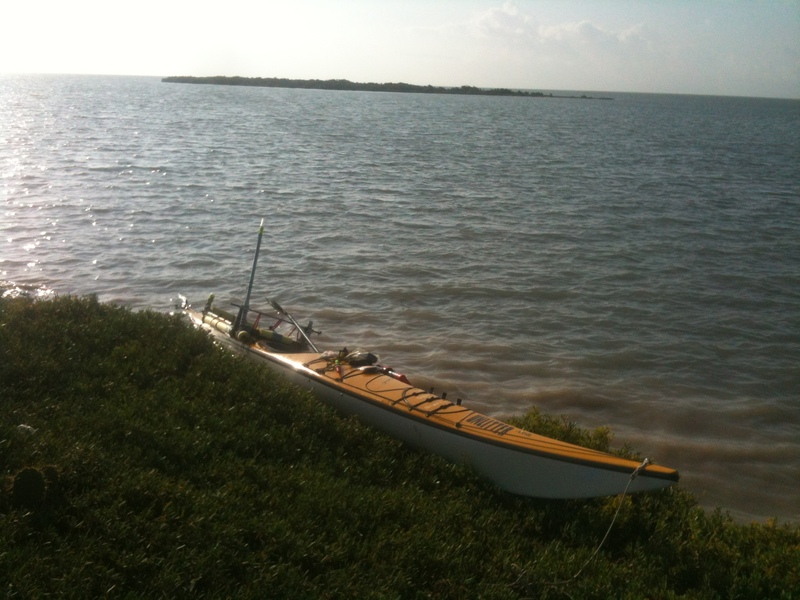 A swing keel sailboat could do it as long as it had a kicker motor. Maybe a hobiecat if it was ready for a really good upwind journey on the way home. 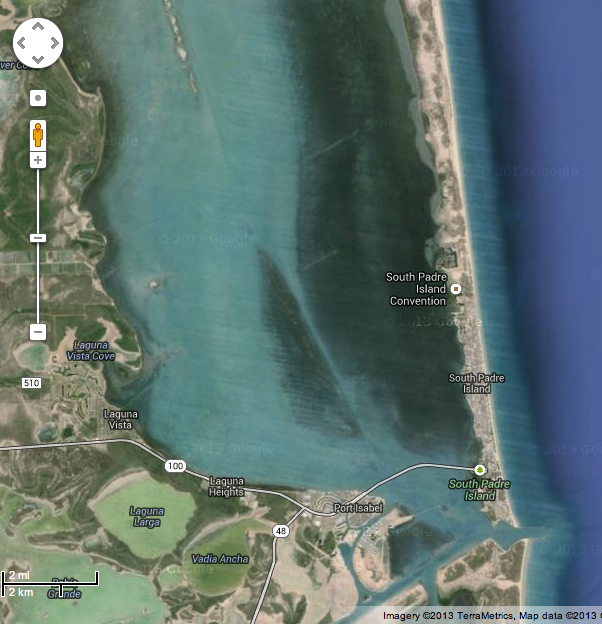 If launched from the kite ranch it would only be 4ish miles but is still a long way in a short kayak. 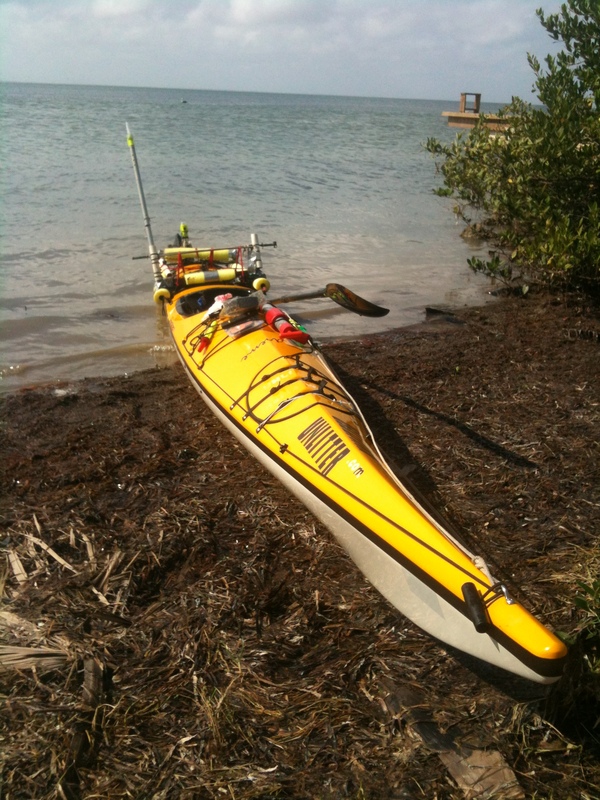 How about a hobie kayak with pedals? maybe? Another sea kayak? Sure! And I got the boat I paddled the entire coast with if someone wants to go out there with me sometime, but only after a couple hour practice session. Getting there is the easier part, coming home would test you and I’m not in a position to be able to rescue someone out there. Know of someone with a boat or jet ski just in case? So, all in all a nice overnighter and scouting mission for other trips . This was the short version and stay tuned for more. Heading west for the kite ranch and the route is directly into the setting sun. I’m about to lose the sun! Here is what my gps shows about my track and where I ended up. Not much dry ground here. It’s moist just left of the yak. 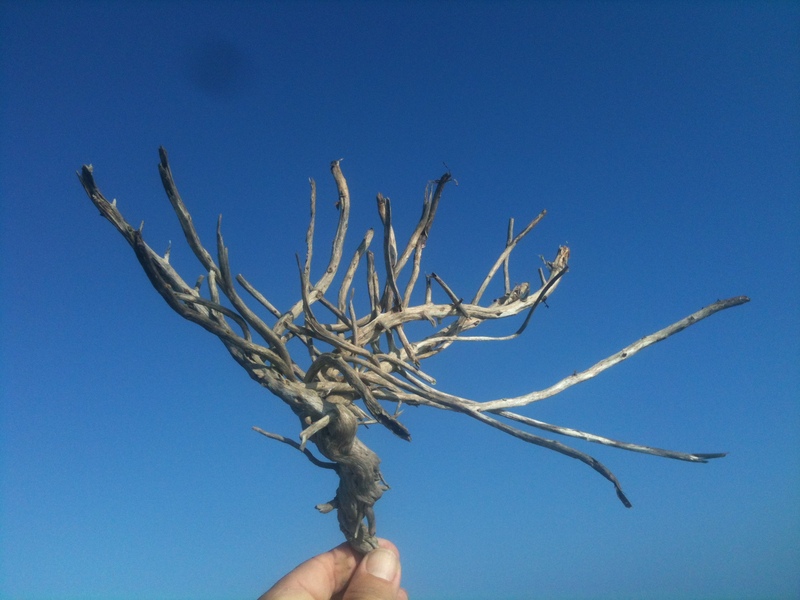 Pretty Driftwood piece, until I got it home and stepped on it while unpacking. Back home but on the portage to the house my cart wheel falls off!